Figure 1. Left : Image of President Obama with landmarks detected using dlib. Center : Delaunay triangulation of the landmarks. Right : Corresponding Voronoi Diagram. In a previous post I had discussed two libraries for facial landmark detection, and had pointed to several interesting applications like Face Morphing, Face Replacement etc. that use facial landmarks. In many such applications a triangulation of facial landmarks is first found (See Figure 1), and these triangles are warped to do something interesting. 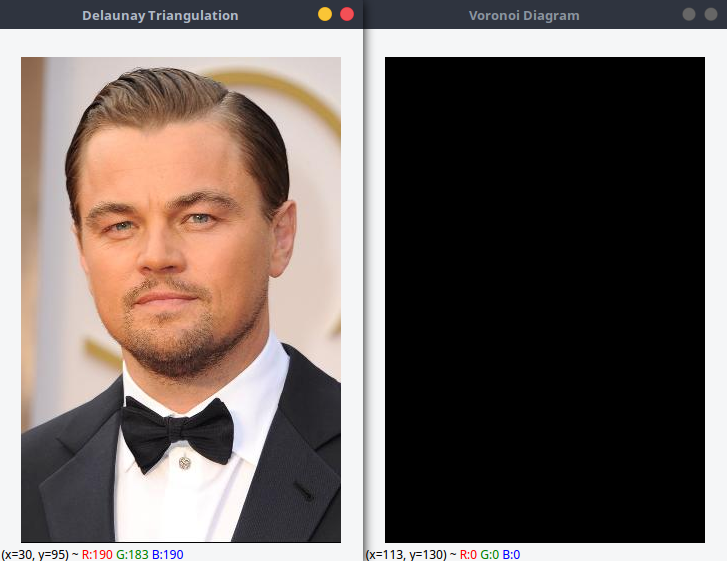 This post will help us understand Delaunay triangulation and Voronoi diagrams ( a.k.a Voronoi tesselation, Voronoi decomposition, Voronoi partition, and Dirichlet tessellation ), and help us uncover a barely documented function in OpenCV. Boris Nikolaevich Delaunay, a Russian mathematician, spelled his last name in two different ways — Delaunay, for French and German publications, and Delone elsewhere. Few people have algorithms or concepts named after them. But Delaunay has one mathematical concept named after each spelling of his last name! — Delaunay Triangulation and Delone Sets. As if all this was not enough, by 1913, he became one of the top three Russian mountain climbers! Delaunay’s Ph.D. advisor was Georgy Voronoy after whom the Voronoi Diagrams are named. And here is another interesting bit of trivia — Voronoy’s Ph.D. advisor was Andrey Markov (yes, yes Markov of Markov chains, and Markov processes fame). What is Delaunay Triangulation ? Given a set of points in a plane, a triangulation refers to the subdivision of the plane into triangles, with the points as vertices. In Figure 1, we see a set of landmarks on the left image, and the triangulation in the middle image. A set of points can have many possible triangulations, but Delaunay triangulation stands out because it has some nice properties. In a Delaunay triangulation, triangles are chosen such that no point is inside the circumcircle of any triangle. Figure 2. shows Delaunay triangulation of 4 points A, B, C and D. In the top image, for the triangulation to be a valid Delaunay triangulation, point C should be outside the circumcircle of triangle ABD, and point A should be outside the circumcircle of triangle BCD. An interesting property of Delaunay triangulation is that it does not favor “skinny” triangles ( i.e. triangles with one large angle ). Figure 2 shows how the triangulation changes to pick “fat” triangles when the points are moved. In the top image, the points B and D have their x-coordinates at x = 1.5, and in the bottom image they are moved to the right to x = 1.75. In the top image angles ABC and ABD are large, and Delaunay triangulation creates an edge between B and D splitting the two large angles into smaller angles ABD, ADB, CDB, and CBD. On the other hand in the bottom image, the angle BCD is too large, and Delaunay triangulation creates an edge AC to divide the large angle. There are many algorithms to find the Delaunay triangulation of a set of points. The most obvious ( but not the most efficient ) one is to start with any triangulation, and check if the circumcircle of any triangle contains another point. If it does, flip the edges ( as show in Figure 2. ) and continue until there are no triangles whose circumcircle contains a point. Any discussion on Delaunay triangulation has to include Voronoi diagrams because the Voronoi diagram of a set of points is mathematical dual to its Delaunay triangulation. What is a Voronoi Diagram ? Given a set of points in a plane, a Voronoi diagram partitions the space such that the boundary lines are equidistant from neighboring points. Figure 3. shows an example of a Voronoi diagram calculated from the points shown as black dots. You will notice that every boundary line passes through the center of two points. If you connect the points in neighboring Voronoi regions, you get a Delaunay triangulation! Delaunay triangulation and Voronoi diagram are related in more ways than one. Georgy Voronoy, the mathematician after which Voronoi diagram is named, was Boris Delaunay’s Ph.D. advisor. Given a set of points, you can calculate the Delaunay Triangulation or Voronoi Diagram using the class Subdiv2D. Here are the steps. A complete working example is shown in the next section. Collect all the points in a vector. // This is how you can add one point. # This is how you can add one point. Define the space you want to partition using a rectangle (rect). If the points you have defined in the previous step are defined on an image, this rectangle can be ( 0, 0, width, height ). Otherwise, you can choose a rectangle that bounds all the points. Create an instance of Subdiv2D with the rectangle obtained in the previous step. Insert the points into subdiv using subdiv.insert(point). The video above shows an animation of triangulation as we add points to subdiv. Use subdiv.getTriangleList to get a list of Delaunay triangles. Use subdiv.getVoronoiFacetList to get the list of Voronoi facets. Here is a complete working example. I have copied some of this code from examples that come with OpenCV and simplified and modified it to suit our purpose. The python example that comes with OpenCV uses the old (and ugly) interface, and so I wrote it from scratch. This code assumes an image is stored in image.jpg and the points are stored in points.txt. Each row of points.txt contains the x and y coordinates of a point separated by a space. E.g. You can also download this code along with the associated data ( obama example in this post ) by subscribing to our newsletter here. // Draw rectangles completely inside the image. // Define colors for drawing. // Read in the image. // Create a vector of points. # Define colors for drawing. # Read in the image. # Create an array of points. If you liked this article and would like to download code and example images used in this post, please subscribe to our newsletter. You will also receive a free Computer Vision Resource guide. In our newsletter we share OpenCV tutorials and examples written in C++/Python, and Computer Vision and Machine Learning algorithms and news. Nice Article. But how did you get the x, y points in obama.txt? Thanks Ruchika. I used dlib [ dlib.net ] to find the x, y points. Specifically, I modified this file in dlib http://dlib.net/face_landmark_detection_ex.cpp.html to write the landmarks to file. Thanks Shubham. Let’s say you want to extract a single triangle from the traingulation. You can use cvFillConvexPoly to fill the triangle with white, and leave the rest of the image black. This serves as a mask to extract the triangle. Dear…. i am working with snake identification from it’s scales. so that i want to make Voronoi diagram with respect to the scale. That’s help me to identify each species…pls help me for making that…………………. Great Blog, thank you for those interesting tutorials.Very helpful! Keep on posting. Thanks Mario for the kind words! Sorry for the late reply. I don’t think you actually need or should use voronoi diagrams for this problem. I would love to see the data. If you have the time, please send me an email at [email protected] and I will suggest something. First of all, thank you for this amazing blog! I have a question about .txt-files which take place in projects such as FaceMorph, Delaunay etc. How to get necessary points from a picture and then put them in a .txt-file? I used dlib to get the landmark points. You can see my post for more details. I am in the process of adding a few new files to dlib that will generate this file more easily. You will receive an email in a few days about that. Thank you so much for prompt response and interesting information! I have already subscribed but I still can’t download the text file. Thanks a lot for this great website . Not sure why you did not receive a link to the code. Please send an email to [email protected] and I will respond with a link to the code. I am assuming you are talking about obama.txt ? Thanks a lot, I have already received an e-mail with the link. How did you generate the points for an image? Hi Mr. Satya Mallick, thank you very much for this contribution. There’s a member function of a subdiv2D called swapedges but i’m not sure how it’s supposed to be used. If you could help me, I would be very thankful. Delaunay triangulation will always choose the triangles shown in “before” because it is designed to choose fat triangles. 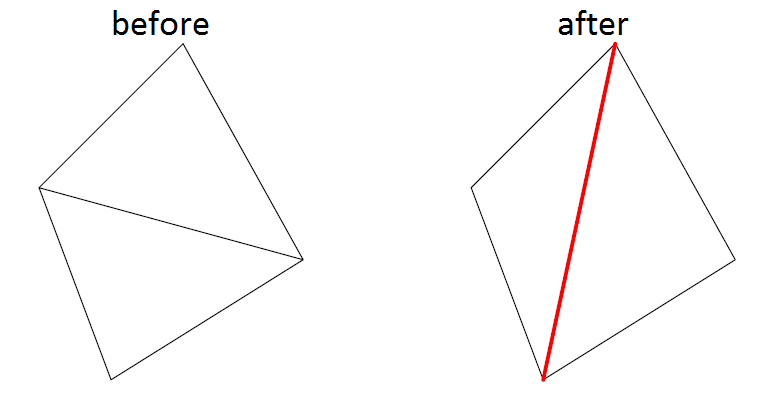 But if you need the triangles to be like in “After” image, you can simply go through the list of triangles and remove the two triangles in “before” and add the two triangles in “after” to the list. 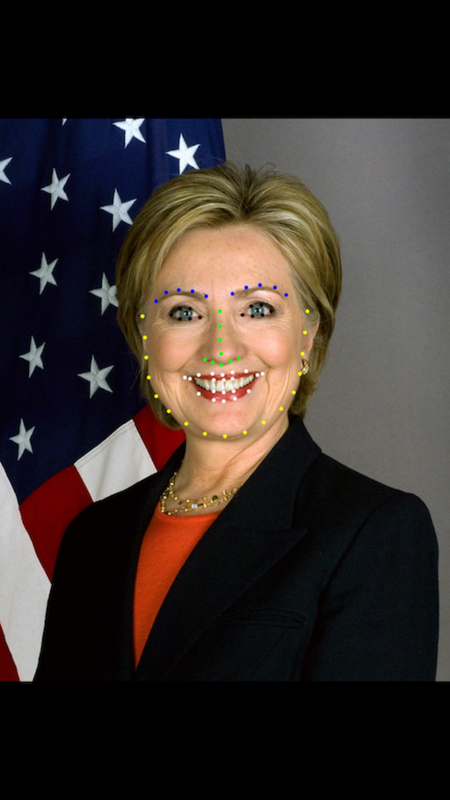 I want to know detail about how the facial landmarks points are detected. Hi, I would appreciate any help about how to extract features from delaunay triangulation. I was trying to get a area from each triangle. However, I got a distinct total number of triangles and not in order. So, how can I deal with this? Thank you. I am sorry I don’t understand the question. The triangles are in no specific order. Hi Satya, thank you for your response. So, how can I use the delaunay triangulation to perform object recognition? Thank you. Thank you for your help and explanation!! Hi, I would appreciate any help about triangulate one small object in a 2d image and how can I get the area of that triangle? How can I achieve that? Thank You. First of all thank you very much for your work. How do I use these codes in the android app? Hi, This post is very useful. But I face up to some problems. Can you help me? When I use these points to make Delaunay Triangulation, I can get list of 828 items => 138 triangulations. I don’t know why I get some wrong point as the photo I show you. Can you tell me the reason. Many thanks. Hello. I want to download the ‘text.txt’ file. I click the subscribe button but I still can not get the file. When you subscribe and confirm you email, we send you a link to all code and other files using in the post. Are you using ifacets, which is a vector of a vector of points, because you need to pass it to polylines as the accepted argument? Hi Satya, nice tutorial! I have a question. I need to collect the distance between all the points, for example: distance between point 1 and 2, 2 and 3 etc… (points from draw_point function). I want to build a simple face recognition software using those distances. How can I get those distances? Thanks! Your doing amazing work. I need your advice on the following. What is the most accurate open source face recognition algorithm ? Is it better than Dlib ? Thanks for sharing your work! Do you have any suggestions as to how to implement this on a 3D object eg point cloud?